Putting the Most Popular Peoria Floor Coatings to the Test: Epoxy vs. Polyaspartic! Here’s what you need to know about how epoxy floor coatings stack up against polyaspartic floor coatings for your home or business! Both epoxy and polyaspartic are popular choices for Peoria concrete floor coatings in areas where work is done with chemicals and heavy machinery, such as in garages or warehouses. These coatings protect the floor from harsh chemicals that are used in mechanical work as well as heavy equipment. They are perfect for garage floors, as well as the floors of industrial settings, such as warehouses and factories. Peoria epoxy floor coatings look great, but take longer to cure than polyaspartic floor coatings. For some jobs, that may be no problem. The other benefits of epoxy might outweigh the downside of the longer time frame, and you may be able to accommodate the longer schedule. A complete floor installation using epoxy can take up to four to five days. That means that you won’t be able to do any work or even be on the floor during that period. If you are installing a new floor for you business or renovating the floor, that can be a huge inconvenience. Your entire business operations will come to a halt while the floor cures. 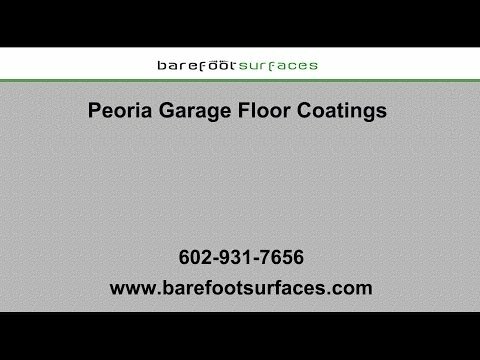 If you are putting in a Peoria epoxy flooring for your home garage, that just means parking your car on the driveway, which may be no big deal. However, if you need the job to be done in less time, you likely need to consider polyaspartic floor coatings. A single coat can cure in less than 10 minutes or as much as a couple of hours, depending on the formulation and the surface temperature. With multiple coatings, a complete installation takes only one day, which minimizes your down time. The only downside of this faster cure time is that the coating can set before application is complete. Bubbles, blisters, and lap lines can form, detracting from the beauty of the floor. A professional installer will know exactly what formulation to use so that the cure time is right for the time required for installation, ensuring that these errors do not appear. Again, the exact formulation of either epoxy or polyaspartic will have a big influence on the final product. However, polyaspartic floor coatings are generally more resistant to abrasions while epoxy floor coatings are generally more resistant to moisture issues. Epoxy resists very high moisture emission rates. While polyaspartic will resist some blushing from moisture emission, epoxy performs better when it comes to moisture issues. The best way to know what your floor needs is to test the moisture vapor emission rate. It may be that the concrete can be prepped a certain way, or it may be that you need to choose another coating. Polyaspartic floor coatings in Peoria are more resistant to abrasions and to damage from harsh chemicals. They can withstand staining and degradation from chemicals like motor oil, brake fluid, and the like. They can also withstand scratches and gouges from moving large machinery around on the floor. Polyaspartic coatings also withstand the effects of UV lighting, so they do not yellow over time. They maintain a glossy and clear finish that will not dull or age with time. Whether you are using epoxy or polyaspartic, you need to use the right chemical mixture and the right techniques to ensure proper adherence of the coating and longevity. That’s why you really must hire a professional to install these floor coatings. In particular, it is important that polyaspartic floor coatings are installed only by professionals. You should not attempt to install these coatings yourself, or you risk damaging the floor and costing yourself a lot of time and money. Polyaspartic is harder to remove or repair than epoxy. However, this should not be a reason to avoid using polyaspartic. You need to choose coatings based on their overall performance, not just on what will be required to repair them later. The choice of floor coating is not just confined to epoxy or polyaspartic. There are different kinds of epoxies to meet different needs, just as there are different kinds of polyaspartic coatings. And for each of those coatings, there are also different mixtures. Each provides different benefits for your floors. What works for one job might not work for another, so you should always consult with a professional floor coating installer to determine the needs of your particular floors. Barefoot Surfaces has been installing all types of floor coatings throughout Arizona for many years. We install floor coatings for residential, commercial, and industrial clients, as well as outdoor epoxy floors in Peoria, and we have the right solutions for every job. Our experienced installers can evaluate your floors and recommend the right coating to provide long-lasting protection and minimal maintenance. We will help you understand your options and discover a solution that fits your budget while also meeting your needs. Call us today to learn about our high-quality floor coatings and experience for yourself the service that makes us one of the best floor coatings providers in Peoria.